Talk about a sweetheart deal hours before Valentine’s Day. Three angelic voices in one heavenly group called The Wailin’ Jennys were making one of their first appearances in Colorado. If Cupid had only a single arrow, he wouldn’t know where to aim. So for an early V-Day celebration, there was no better place to be on February 13 than Loveland, Colorado. Known as “America’s Sweetheart City,” it is famous for providing special valentine postmarks on love letters and cards requested by lovebirds from around the world. The intimate and historic 450-seat Rialto Theater in downtown Loveland was the perfect setting to hear the gifted Jennys, whose three voices blend so beautifully that you’ll wonder, “Is this heaven?” Maybe not, but the soothing sounds from this triple threat are likely on the playlist at St. Peter’s pearly gates. Though kid-friendly (tots, tweens and teens were spotted), the show that began without an opening act shortly after 7:30 was made for loving couples — or those that could use a little spark. The irony might have been lost on the Lovelandlubbers, who prefer to express affection 365 days a year. 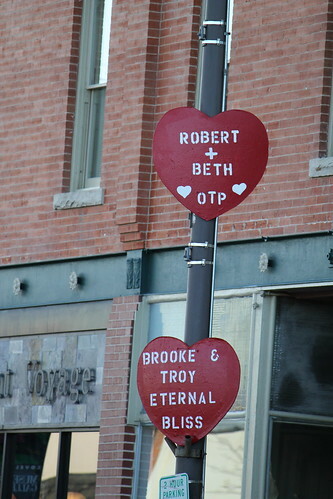 One of the town’s yearly money-raising projects involves decorating streetlight poles with big red hearts that include messages of love to each other’s sweetie (left). This passion play had other, less visible signs of deep devotion. The crowd was lovingly respectful of the Jennys’ delicate balancing act. They remained so you-can-hear-a-pin-drop quiet that the trio’s deep breaths were clearly audible during a cappella versions of numbers including the traditional “Bright Morning Stars,” “Kissing Double,” Bruce Cockburn’s “Going Down The Road” and “The Parting Glass,” an old traditional Irish song that closed the show. Moody’s soulful “Storm Comin,’ ” one of the new album’s finest cuts, also was performed a cappella, but included foot stomps and hand claps, though the audience seemed reticent to join in. “Can you try that with us?” Moody (right) asked. Many in the full house shook their heads in amazement, chuckling at the thought of trying to match her pitch-perfect display. “Laughter is never a good sign,” Moody said, resigned to the fact that the impromptu singalong might be doomed, no matter how earnest an attempt the amateurs might make. Ultimately, the three were on their own. With glorious pipes like these, isn’t that the way it should be? Moody, the Winnipeg, Manitoba soprano who co-founded the group with fellow Canadian Mehta about nine years ago, is the most likely to succeed as a solo artist. (The Garden, her Juno-nominated album, was an under-the-radar release that deserved mention as one of 2010’s best.) While sharing lead vocal duties, the classically trained vocalist and pianist displays instrumental versatility by playing banjo, guitar, accordion and bodhran (a one-sided Irish drum that looks a huge tambourine), and showed off those skills in four of the first five numbers. The Jennys, from left: Heather Masse, Nicky Mehta, Ruth Moody and guest fiddler Richard Moody. The uninitiated might mistakenly identify “three-part harmonies” with the Lennon Sisters or the folkie spoof A Mighty Wind. The Wailin’ Jennys surpass those labels on all levels. An equal-opportunity, three-dimensional assemblage, their melodies rate with that higher-profile power Trio of Emmylou Harris, Dolly Parton and Linda Ronstadt. The songwriting responsibilities are equitably distributed on Bright Morning Stars (each contribute four), and all unselfishly take turns in the concert spotlight. Obviously, a group whose name is a takeoff of country legend Waylon Jennings and have performed on Garrison Keillor’s public radio show A Prairie Home Companion know how to show their sense of humor. They reveal that comedic flair during masterful storytelling intros to their songs. “Fetching, each in their own unique way,” was how one elderly admirer in the fourth row described them during intermission to his better half, one of the few apparently in an unromantic mood (or taking this anti-Valentine’s Day thing to heart). Well, they certainly know how to carry a tune. Mehta (left), who played guitar, ukulele, harmonica and a snare drum during the show, is an acerbic wit. Displaying a prominent tattoo on her right arm, this Salt-of-the-Earth Mother brings her twin 18-month-old boys along for the tour bus ride. When they were younger, Mehta said she put her sons in their Johnny Jump Ups to gauge how good her songs were. 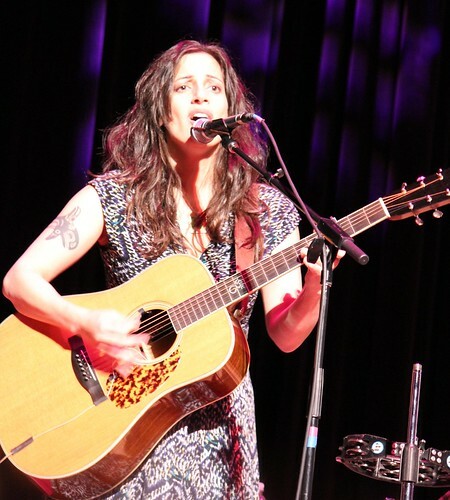 Introducing the Emmylou Harris/David Olney-penned “Deeper Well,” Mehta said, “This next song is a winner to them. Inspired much height in the bouncing … sometimes impact.” The driving number including a fiery turn on the viola by Moody’s brother, Richard. Dubbed the “Mad Jenny” by his kid sister, he also plays fiddle and mandolin as the tour replacement for previous sideman Jeremy Penner. Both are among a formidable group of skilled musicians (Colin Cripps, Kevin Breit, Bill Dillon) on the album that was co-produced by Mark Howard and David Travers-Smith, a frequent Jennys collaborator. Masse (right), a New Yorker who joined the group in 2007, is the alto with the deep, blue voice. 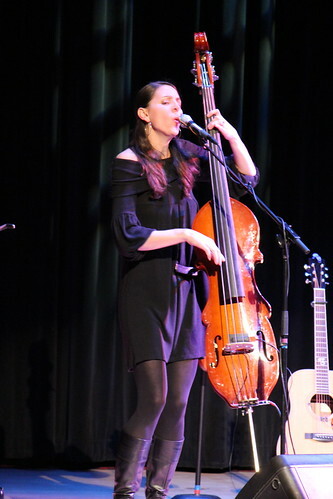 Nearly as statuesque as the upright bass she plays, the graduate of the New England Conservatory of Music grew up under the influence of jazz singers such as Ella Fitzgerald, Sarah Vaughan and Billie Holiday. “They sang so many great songs, so many heartbreaking love songs,” she offered. While other numbers like “Beautiful Dawn,” from 2004’s Juno Award-winning 40 Days, are about new beginnings and “perfect for anti-Valentine’s Day,” according to Moody, these bright, shining stars really know how to get to the heart of the matter. 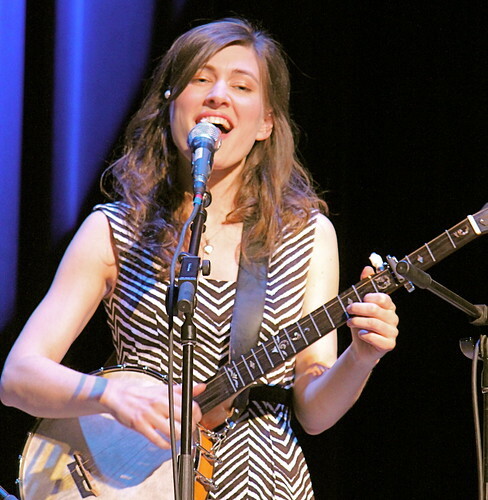 So when the tour heads east, resuming March 17 in Pennsylvania, plan to make a hot date with The Wailin’ Jennys and prepare for the love affair to begin. Without the hugs and kisses. Concert and Loveland photos by Michael Bialas.